In Q2 2018, Ryder reported record total revenue and record operating revenue. Total revenue for the three months ended June 30 were $2.1bn, an increase of 17% compared to the same period in 2017. Operating revenue grew by 11% to $1.6bn. Total revenue and operating revenue grew across all three business segments reflecting new business and higher volumes. Additionally, Supply Chain Solutions (SCS) revenue growth benefited from the acquisition of MXD Group, Inc. Total revenue also grew due to higher fuel costs passed through to customers. In the Fleet Management Solutions (FMS) business segment, total revenue was $1.30bn, up 11% compared with $1.16bn in the year-earlier period. FMS operating revenue was $1.08bn, up 8% from the year-earlier period. 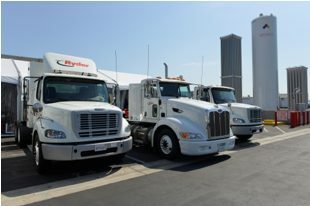 On June 15, 2018, the Company acquired Metro Truck & Tractor Leasing, Inc. (Metro), a full service leasing, rental, and maintenance company, which added approximately 900 vehicles to Ryder’s FMS fleet. The financial results of Metro were not material to FMS results for the quarter. FMS earnings before tax were $72.9m, up 7% compared with $68.1m in the same period of 2017, primarily reflecting higher commercial rental and used vehicle sales results. In the Dedicated Transportation Solutions (DTS) business segment, total revenue was up 21% to $331m and DTS operating revenue was up 7% to $214m compared with the year-earlier period. DTS total and operating revenue growth reflects increased volumes and new business. DTS earnings before tax of $18.5m increased 25% compared with $14.8m in 2017, due to revenue growth and improved operating performance. In the SCS business segment, total revenue was up 30% to $605m and SCS operating revenue was up 20% to $430m compared with the year-earlier period. SCS operating revenue growth largely reflects new business and increased volumes. Total and operating revenue growth also reflect the acquisition of MXD Group, Inc. (MXD) on April 2, 2018. MXD is an e-fulfilment and last mile delivery provider for big and bulky goods with a national network of facilities. MXD is expected to add approximately $220m in annual total revenue. SCS earnings before tax of $37.7m increased 45% in the second quarter of 2018 compared with $26.1m in 2017, driven by revenue growth and better operating results, including improved performance on new account start-ups.